Thanks to the media circus following Matt Harvey, one could hardly tell that the Mets are becoming one of the hotter teams in baseball right now. Winning eight of their last 11, including a 6-1 tilt against the San Francisco Giants Tuesday night, the Mets have righted the ship and injected life back into a season that the most extreme fans declared lost just over a week ago. Last night, we saw the Amazins fire on all cylinders: a stellar starting effort from Zack Wheeler, an offensive explosion across the board, and a lights-out performance from the bullpen. Because of my weekly Sunday softball doubleheader (Go Dog Pirates! ), I was not in the know when the suspension of Harvey came down. Some of the guys on my team with more “colorful” imaginations speculated that the suspension was a result of a prank in Kevin Plawecki’s locker that appeared in a post-game photo. The organization has been sketchy about the whole situation, but as details continue to emerge days later, it seems that the reason stems from Harvey missing Saturday’s game due to a long night of partying and a morning golf game. Harvey’s behavior is unacceptable and is just the latest in a long line of incidents violating team rules. Several of his teammates have begun to speak out on his behavior, including Jose Reyes, and any time Jose Reyes is getting the moral high ground on you, you should be ashamed. I hate that this continues to be a storyline surrounding this ballclub, but nevertheless, here we are. Harvey appeared before the media to apologize and will make his next start in Milwaukee on Friday. Short of a stellar effort on the hill, and maybe even then, Harvey is going to deal with a tremendous amount of scrutiny from both the media and the fanbase going forward. His poor performance in 2017 thus far is a major indicator that the Dark Knight is just not in the right place mentally and certainly is not a candidate to take up the mantle of ace in Thor’s absence. Tuesday night’s effort was easily the best performance we have seen from Wheeler since he returned from Tommy John surgery. Wheeler was complete and was able to get all of his pitches working. Throwing six innings, he allowed two hits, one earned run, struck out four, and walked four. The one run he allowed was a homer cracked by Buster Posey. Subtract that one mistake and Wheeler’s effort is even more impressive. It’s extremely encouraging to see Wheeler record his first quality start of the season. Now more than ever do the Mets need the young right-hander to live up to expectations, given their current lack of starting pitching depth. In a perfect world, I would like to see him cut down on the walks and become more efficient with his pitch count, but you have to take what you can get at this point. The Giants, like the Mets, are depleted by injuries right now. As a result, the Giants are experimenting with perennial infielder Eduardo Nunez in left field. This experiment, which gave me flashbacks of when Daniel Murphy tried to man the outfield, paid dividends for the Mets immediately. Neil Walker smacked a blooper off Jeff Samardzija and ended up with a two-RBI triple after the ball slipped past Nunez’s glove. In another contract year for Walker, the switch-hitting second baseman has struggled, with a batting average just north of the Mendoza line at .217. It’s nice to see Walker catch a bounce his way. Hopefully, this will result in a positive spike in production. In any professional sport, the expectation is that when a starting player goes down, it is up to the backup to step up and perform in their place. Both T.J. and Rene Rivera have personified that belief to a tee. 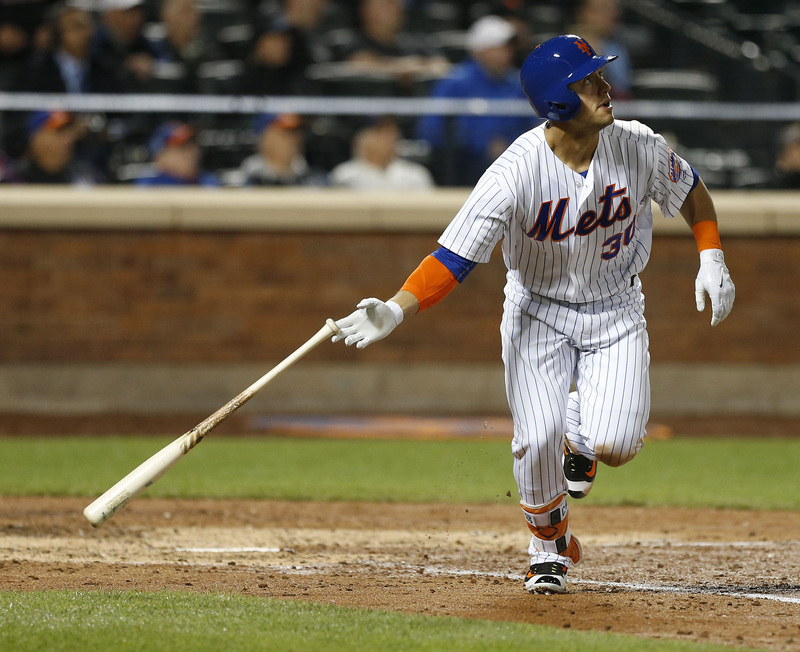 T.J. Rivera remains smoking hot, as he added three more hits lat night, including an RBI double that scored Michael Conforto in the bottom of the second. Rene continued his hot streak as well, smacking two hits including an RBI double that sailed over the head of Gorkys Hernandez in center field and brought Jose Reyes home in the first. With the way these two are playing, there is absolutely no rush for Lucas Duda or Travis d’Arnaud to return. With Duda nearing a return sometime in the next few weeks, it would be a shame to see T.J. Rivera relegated to the bench in the midst of this hot streak. With the exception of hitting Justin Ruggiano with a pitch in the eighth, the Mets’ bullpen was perfect tonight. The combined efforts of Hansel Robles, Jerry Blevins, Addison Reed, and Jeurys Familia tossed three shutout innings, striking out one and surrendering no hits. I cannot stress enough how crucial this bullpen is to this team’s success. With a diminished starting rotation and Terry Collins’s propensity to pull his starters sooner rather than later, the Mets’ bullpen is bound to be overused of the course of this season. When deployed properly, this team has one of the better bullpens in the National League, but it’s really on Terry’s shoulder to ensure that they are used in the manner in which they should be. I’m still baffled how Conforto went from being almost guaranteed to open the season in Las Vegas to being the best offensive player on the roster. Adding two more hits last night, including a moon shot home run, Conforto is batting .330 with eight home runs and 21 RBIs on the season. He’s been everything we could dream of and more in the leadoff spot and he has my All-Star vote. The crown belongs to Wheeler. Six innings of one-run ball and his first quality start of the season put the Mets back at .500 and gives this team a fresh slate. As I mentioned above, it’s extremely encouraging to see Wheeler resemble his form as a high potential starter. Quick turnaround for the Mets, as they wrap up the series with a 1:10 p.m. contest against the Giants. Tommy Milone makes his debut for the Mets against Matt Cain. The Mets have the day off Thursday and then travel to Milwaukee Friday to open a three-game set with the Brewers. Matt Harvey, theoretically, will open the series against Matt Garza.